Money Saving Social Skills Bundle! This bundle includes four of my most popular products! 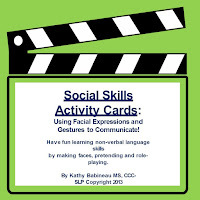 Role Playing Social Skill Cards: Easy and fun to use in small groups or as a whole class activity. The cards cover many social skills that are critical for forming friendships and interacting effectively in the classroom including: empathy, self-advocacy, compliments, apologies, and more. This activity pack includes 44 Role Playing cards along with a simple visual to remind students to think about not only their words, but also body language, facial expressions and tone of voice. All cards and the visual poster are in black and white for easy printing. Social and Safety Skill Questions/Discussion Cards: Encourage your students to think of logical, appropriate solutions to everyday social and safety situations! Use one or two a day as part of a whole class morning meeting discussion or use multiple cards in short discussions or in a game format! There are no specific "right" answers to these questions. Encourage your students to think about how to solve everyday issues and justify their responses. This set contains 40 question cards and an optional board game. Social Skill Activity Cards: Be silly and have some fun as you help your students to become better nonverbal communicators! Many kids with social language weaknesses have difficulty using and interpreting facial expressions and body language correctly. In this fun activity, kids will get practice making faces to convey emotions, using their bodies to "pretend" to be doing activities, and role playing situations using tone of voice, body language and facial expressions. This kit contains: 12 "Make a Face" Cards, 28 "Pretend" Cards and 16 "Role Play" Cards. These are created in Black/White for easy printing! These products also sold individually.